Charlie O’Dowd was in mid swing when the silver Lexus pulled in behind his truck. His legs flexed as the maul sliced through the log he’d set on a stump. “Hey, you,” he called when his daughter stepped out from the driver’s door. “Hey, yourself,” she called back while her eight–year-old daughter climbed out of the back seat of the sedan. The young girl carried a phone, earbuds fixed into her ears. Charlie bent down to grab another log from the pile of stove-wood he’d cut to size with his chainsaw. He placed the piece of red oak on the chopping block before walking over to his daughter’s vehicle. After she hugged her father, Rita Bennett told the girl to remove the headphones. Rita had phoned her father only a few times since her mother’s funeral. Their conversations had been pretty much the same. Her father never thought to ask after Rita’s husband. After that, there would be long silences between the few remaining words exchanged between the two of them. After she’d turned off the macadam, Rita had steered down a logging road that meandered through the conifer forest. While her mother navigated around boulders, through potholes, and over coverts that appeared to erupt from the dirt-and-grit surface, the eight-year-old in the back seat groaned upon discovering that she no longer had any bars on her phone. Her groans had turned to moans when Rita explained that her grandfather’s cabin would have no internet service, no television reception, not even a landline. How long had it been since Rita made the drive to her parents’ camp in western Maine? Before I had Robyn, she had thought while pulling past a little wooden dock that extended into the pond across the lawn from her father’s cabin. “Is that the peapod?” Rita pointed to the side of the dock as she popped the car’s trunk. Her father nodded his head while helping her unload the luggage she’d packed the previous evening. “But what are we going to do for three days?” Robyn whispered to her mother. They’d been setting their clothes into the drawers of an antique oak dresser that smelled of mothballs. Rita promised she’d start up the Lexus to recharge her daughter’s smart phone so the young girl could listen to music. After they unpacked their things, Robyn followed her mother out of the bedroom that had been Rita’s when she was her daughter’s age. Charlie O’Dowd’s “girls” walked out to the porch, where he was seated in a rocker. They sank down into the cushions of an old couch that took up the porch’s entire back wall. A bamboo fly rod hung over the couch, suspended on two spruce notches. In a photograph hanging beside the rod, Charlie was bending forward while releasing an enormous brook trout into the water. The porch faced a pond framed by white birch and golden aspen, trees that Rita’s father called popples. A slight breeze rustled their leaves. The double-ended peapod Rita had first seen when she pulled into the drive beside the cabin bobbed gently beside the dock. “What was that?” Rita’s daughter cried when an eerie wail pierced the stillness of the late August afternoon. “A loon.” Charlie O’Dowd pointed toward a comely bird floating on the pond’s rippled surface. The loon turned its head back over a shoulder and using a large pointed beak, preened its black-and-white feathers. As they watched from the porch, the bird disappeared from view. The loon left a large series of rings that emanated outward upon the water. “Where’d it go?” Robyn asked. “Fishing for dinner, I suspect.” Charley unfolded his lanky frame from the rocker. “Which is what we need to do if you want to eat,” he continued. Robyn turned to her mother with a confused look on her face. “We brought plenty of food.” Rita looked over at her father, who grabbed a cap from a hook behind the cabin door. “Besides what happened to catch and release?” she added. “Catch and release is fine, but there’s nothing wrong with keeping a few trout for the frying pan.” Charlie held the cap by its tattered brim. “Remember this?” he said. “As I recall you found that old thing washed up on shore,” Rita answered. “Mom agreed, but only if she could wash it first.” Rita smiled at the thought. The cap brought back memories of the summers Rita spent at the cabin that was one of only three built along the easterly shoreline of Lost Pond. Now, looking out across the water, she watched the sun change from yellow to gold. Rita recalled how the sun would sometimes turn bright orange just before it slipped below the hills along the western edge of the pond. “Dad, she just spent nine hours in the car,” his daughter protested. “Be a good time to fish the evening hatch,” her father persisted. Her parents had tried to pass on their love for field and stream to their daughter. By the time she was ten, Rita could cast a fly line as well as most men. During the early part of the fishing season, when the brook trout would follow the smelt from the pond up through Otter Brook, mother, father, and daughter would line the banks of the little stream while casting colorful streamers with names like Mickey Finn, Ballou Special, and Supervisor. Rita’s mother had become known for her ability to fashion streamers first tied by Carrie Stevens, as well as some of her own design. Those who frequented the rivers and streams of the region came to rely upon her patterns. So much so that the stores in Riverton began stocking them. It wasn’t long before those in the bigger towns like Bethel and Farmington, as well as others located across the border in New Hampshire, began placing orders. Rita remembered her father using lead line to troll along the bottom of the deep pond during the summer months. Although the peapod was only thirteen feet long, she always felt safe seated between the boat’s lapstrake sides. Rita had learned to row while still quite young. Her father’s friends would kid him, saying that he trained his daughter so he could fish, but she loved the rhythm of the ash oars and the motion of the boat as it cut through the water. During her college years, Rita began to lose interest in brook trout, streamers, and peapods. After she met Derrick, there never seemed time for such things. On her Facebook page, she’d described her parents as hobbits and compared her childhood to living in the shire. Patsy had taken it as a compliment, but Charlie was not so sure. “Do I have to go?” Robyn whined. “I suppose you do,” her mother urged as they followed Charlie down to the pond. “You’ve never been in a boat?” Charlie asked his granddaughter. “Not if you don’t count the steamboat that time we went to Disney World,” she replied. “And I suppose you’ve never been fishing either?” he said with mock disgust. “Are we really going to kill a fish?” The little girl scrunched up her face in genuine horror. With his legs outstretched, Charlie faced his granddaughter and pulled back on the oars. “Mom says you shouldn’t use that word,” she responded. Rather than answer, his granddaughter stared down at the blackened face of her phone that by then had lost power. “Enough chitter chatter.” Charlie opened his tackle box and removed a small metal container. He plucked a bushy fly from among a dozen or so arranged in neat lines inside the tin. “There’s another one.” Robin pointed to a rise form a bit farther out on the pond. “And another,” she called out as a trout surfaced a few feet from the others. A puzzled expression crossed over his granddaughter’s face. “Like a caterpillar turning into a butterfly,” he said. “Is that one of grandma’s flies?” Robyn pointed to the pattern Charlie had tied to the end of his line. “Well, there was this especially ornery old trout by the name of Hooked Jaw Sam. 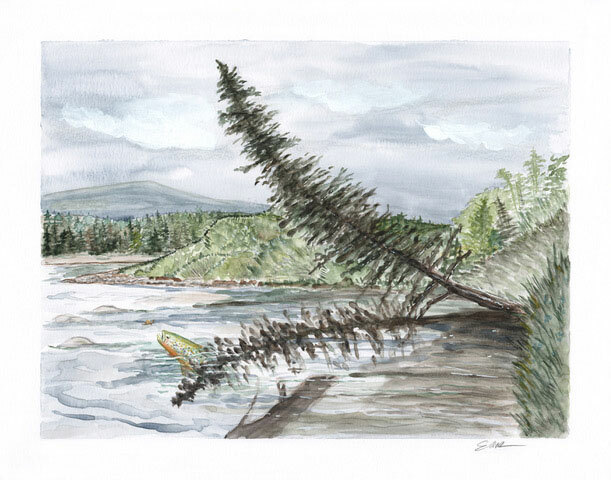 He lived right over there.” Charlie pointed to an indentation in the shoreline where a spruce tree was growing perpendicular to the water. The very next morning, your mam rowed back out and spent the day casting over that fish’s hole. She did so every day until the season came to an end,” her grandfather explained. “So, what happened?” the girl asked. Charlie might not have had the gift of gab, but like any good Irishman, there was a bit of the blarney in him. “It was nearly time for us to pack up our things at the end of that summer when Patsy, that was your gram, she comes up with this here little bitty pattern she names Rita’s Revenge.” Charlie raised the fly at the end of his line. It was dark by the time Charlie O’Dowd rowed the peapod back to the dock. By then, Robyn was wearing the cap with the tattered brim. Charlie had taken nine fish. At first Robyn had simply watched, but when her grandfather handed her the fly rod, she played the last few to the net. Charlie had broken the necks of six of them, placing each in a wicker creel laced with ferns. He returned the last three after explaining how he never took more than he could eat and only did so no more than once each week. When they entered the cabin, they found Rita seated at her mother’s desk. For a moment, Charlie thought it was his Patsy. On the desk was the box he’d built out of maple to hold his wife’s fly-tying material. Gathered in front of the box, at the base of a simple Thompson vice, were a number of flies similar to the one Charlie had tied to his line.